Welcome to Orchid Expo 2015 Show and Sale! 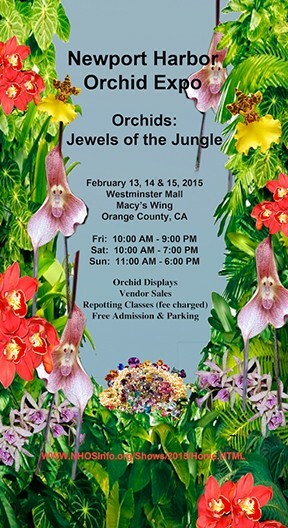 The Newport Harbor Orchid Society will host its 13th Annual Orchid Expo and Sale on Friday, February 13th through Sunday, February 15th, 2015, at the Westminster Mall, in Orange County California. The event is free and open to the public. This year’s event, themed “Orchids: Jewels of the Jungle” will showcase thousands of orchids in bloom from all over the world. Orchids are the largest family of flowering plants with over 35,000 known species and hybrids, and they grow in every part of the world. Judging of the plants will be conducted by accredited judges of the American Orchid Society and the Cymbidium Society of America as well as by local society members. The two potting workshops are scheduled for Saturday, February 14, and Sunday, February 15. Registration is limited to the first 20 registrants for each class. To register send an e-mail providing your name and phone number to ndbenay@cox.net.